Even with the destruction of over 700 homes, reports of injuries by lava bombs spewing from Kilauea, and ongoing eruptions and lava flows, this island of Hawaii, in general, still remains safe for travelers if they take the proper precautions. Boat tours, cruise lines, and airlines have modified their schedules and routes when necessary. Visitors are cautioned to stay abreast of news about the active Kilauea volcano and be ready to avoid affected areas. Hualalai, on the western side of the Big Island of Hawaii, is the third youngest and third-most active volcano on the island. The 1700s were years of significant volcanic activity with six different vents erupting lava, two of which produced lava flows that reached the sea. The Kona International Airport is built atop the larger of these two flows. Despite much construction of businesses, homes, and roads on the slopes and flows of Hualalai, it is anticipated that the volcano will again erupt within the next 100 years. Once believed to be an offshoot of its large neighbor, Mauna Loa, scientists now have concluded that Kilauea is actually a separate volcano with its own magma-plumbing system, extending to the surface from more than 60 kilometers (over 37 miles) deep in the earth. 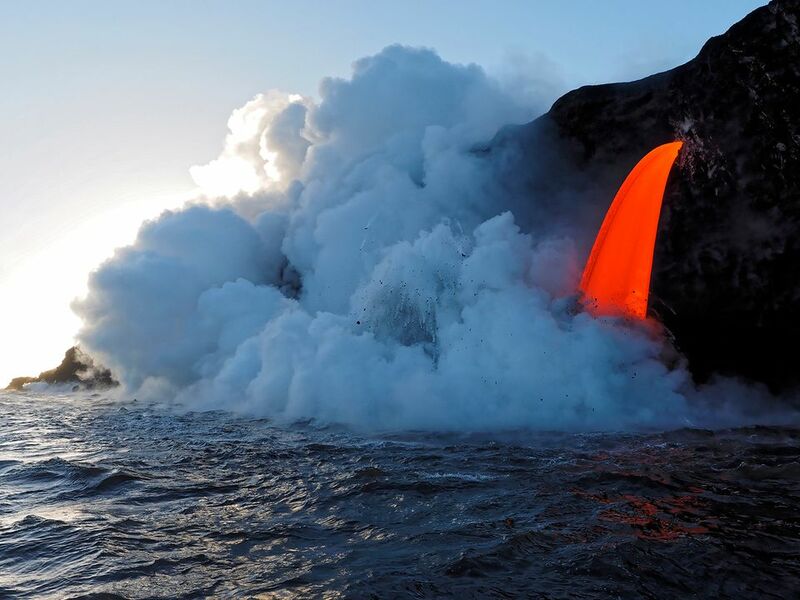 Kilauea Volcano, on the south-east side of the Big Island, is one of the most active on earth. Major eruptions started in January 1983 and continue to this day. Kilauea has been erupting nearly continuously since 1983 and has caused considerable property damage, including the destruction of the town of Kalapana in 1990, and the destruction of Vacationland Hawaii more recently. The Lower Puna eruptions which began in May of 2018, opened two dozen lava vents in Puna. The earthquake in May 2018 measured 6.9 on the Richter Scale and caused nearly 2,000 residents to be evacuated from the Leilani Estates subdivision and surrounding area. In the course of these eruptions, lava flows have destroyed a famous 700-year-old Hawaiian temple, (Wahaʻula heiau), spread through and ruined many housing subdivisions, and permanently blocked several highways. Along with Mauna Loa, Kilauea forms part of Hawaii Volcanoes National Park. The most recent eruptions, sections of the park have closed and reopened, including the Kilauea Visitor Center. As of September 2018, the Visitors Center had re-opened. Officials at the park warn that visitors should be prepared for unannounced closures. Of course, the fissures and lava flows have extended beyond the confines of the national park. Travelers will want to exercise caution when visiting the area. Earthquakes and lava flows have damaged roadways, and tourists should not attempt to get around roadblocks officials have erected to deny access to these areas. There are no indications that the current volcanic activity will come to an end anytime soon. Kohala Volcano is the oldest of volcanoes that form the Big Island of Hawaii, having emerged from the sea more than 500,000 years ago. Over 200,000 years ago it is believed that an enormous landslide removed the volcano's northeast flank forming the amazing sea cliffs that mark this part of the island. The height of the summit has reduced over time by over 1,000 meters (over 3,280 feet). Over the centuries, Kohala has continued to sink and lava flows from its two much larger neighbors, Mauna Kea and Mauna Loa have buried the southern part of the volcano. Kohala is today considered to be an extinct volcano. Mauna Kea, which in Hawaiian means "White Mountain," is the tallest of Hawaii's volcanoes and in fact the tallest mountain in the world if measured from the floor of the ocean to its summit. It received its name, no doubt because snow is frequently seen on the summit even from the distant shores. The snow occasionally reaches several feet deep. The summit of Mauna Kea is home to numerous observatories. It is considered one of the best places to view the heavens from the surface of the planet. Several tour companies offer evening trips to the summit of Mauna Kea to view the sunset and then view the stars. The Onizuka Center for International Astronomy, located near the summit, is an excellent place to learn more about the history of the mountain and the work done by the observatories. Mauna Kea is categorized as a dormant volcano, having last erupted about 4,500 years ago. However, Mauna Kea is likely to erupt again someday. The periods between eruptions of Mauna Kea are long compared to those of the active volcanoes. Mauna Loa is the second youngest and second-most active volcano on the Big Island. It is also the largest volcano on the face of the earth. Extending to the northwest near Waikoloa, to the entire southwest part of the island, and to the east near Hilo, Mauna Loa remains an extremely dangerous volcano which can erupt in many different directions. Historically, Mauna Loa has erupted at least once in every decade of recorded Hawaiian history. It has, however, since 1949 slowed its pace with eruptions in 1950, 1975 and 1984. Scientists and residents of the Island of Hawaii constantly monitor Mauna Loa in anticipation of its next eruption.